Village of Exeter: Exeter Public Library Summer Reading Program! Librarian Jessica Votipka and soon to be first graders Jolene Vossler (middle) and Jaiden Papik color pinwheels at the Exeter Public Library Summer reading program. Treton Vossler (right) and Mikey Bartu work on coloring the front and back of their pinwheels at the Exeter Public Library Summer reading program on Monday morning. Librarian Jessica Votipka and soon to be second grader Trenton Vossler assembles his pinwheel at the Exeter Public Library Summer reading program. Library Reading Program K-1st grade participants blowing on their pinwheels from the left Trenton Vossler, Jolene Vossler, Mikey Bartu and Kierra Papik. 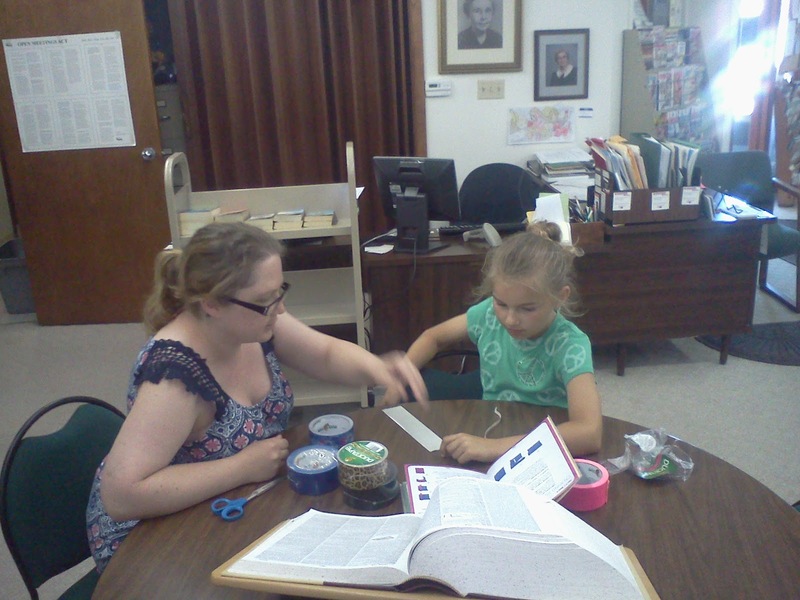 Jaiden Papik makes a duct tape wallet with Librarian Jessica Votipka at the Exeter Public Library Summer reading program. The Exeter Public Library Summer Reading Program has been a hit this summer. There have been a few changes to the program this year, with each age group just having one session instead of a weekly session. Also new this year, was a session for toddler’s that will take place on Friday, June 28th at 10 a.m. and a session for 4th and 5th graders earlier this summer. Some of the activities completed in this summer’s reading program were a duct tape wallet, paper pinwheels, designed their own giant trap, made an ocean scene and the toddlers will have a program on dinosaur’s.